During our monthly Spotlight Series cabaret-style show for October, we will take a look at the era commonly referred to as ‘the golden age of musical theater.’ These were the times when iconic musicals such as Anything Goes, 42nd Street, Guys and Dolls, The King and I, Oklahoma!, and so many others solidified their places in musical theater history. This month, in The Golden Age, we will revisit some of the most iconic moments that have happened on the musical theater stage. 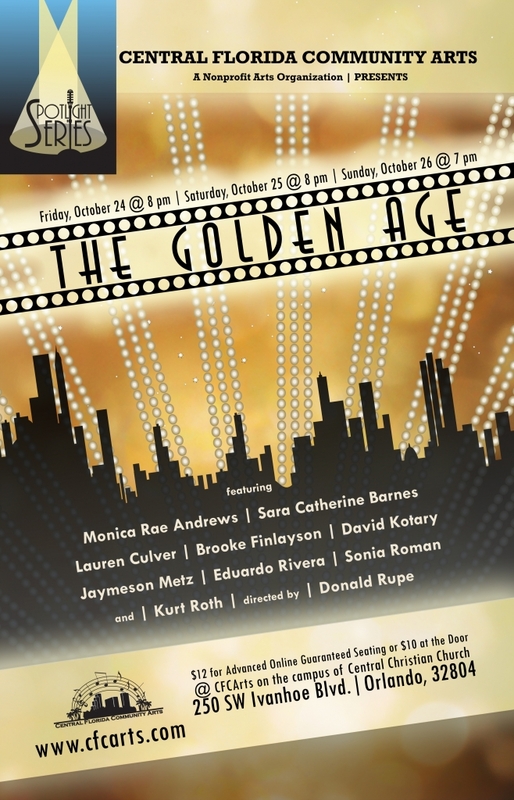 The Golden Age will take place on Friday, October 24 and Saturday, October 25 at 8:00pm and Sunday, October 27 at 7:00pm at CFCArts’ Central Campus, which is housed on the grounds of Central Christian Church, 250 SW Ivanhoe Blvd., Orlando, 32804. Please park behind the church, going around the left side of the building, and taking care to not use the I-4 entry ramp, which is next to the church’s driveway. Guaranteed seating can be purchased in advance for $12 (credit card/Paypal) or, if available, can be purchased for $10 at the door (cash/check only). Doors open 30 minutes before showtime and all seating is general admission.